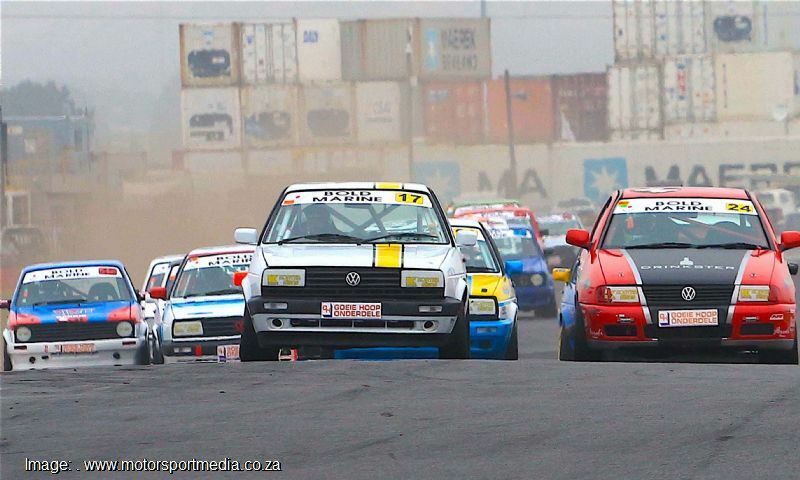 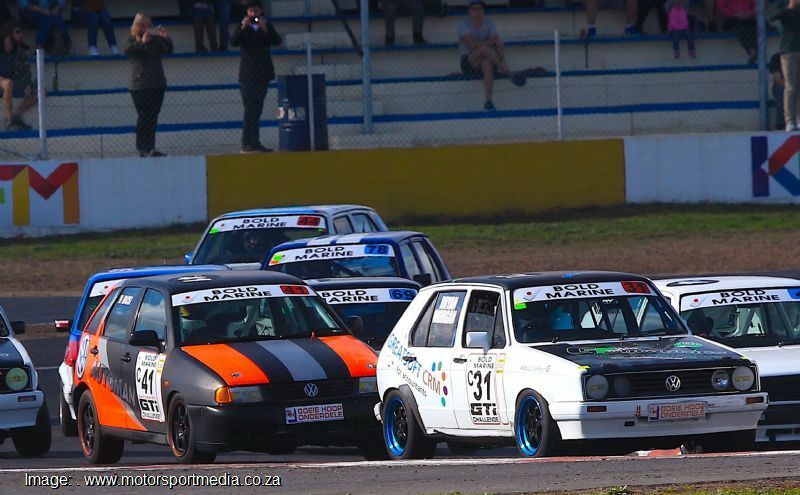 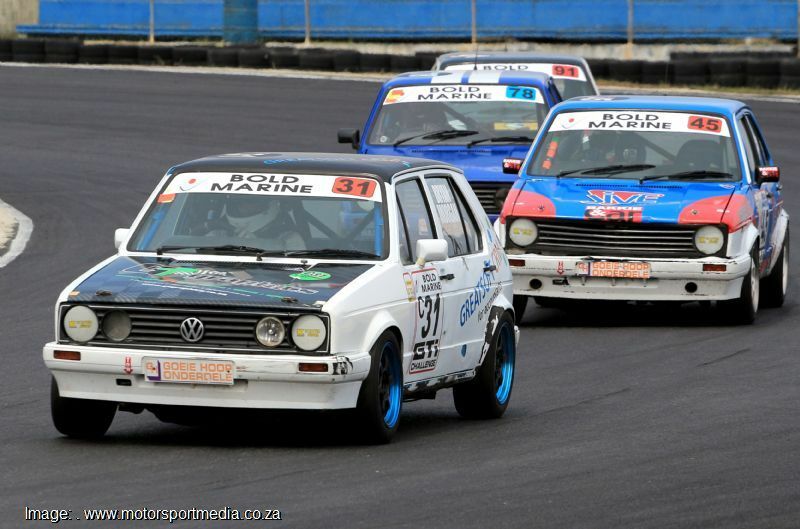 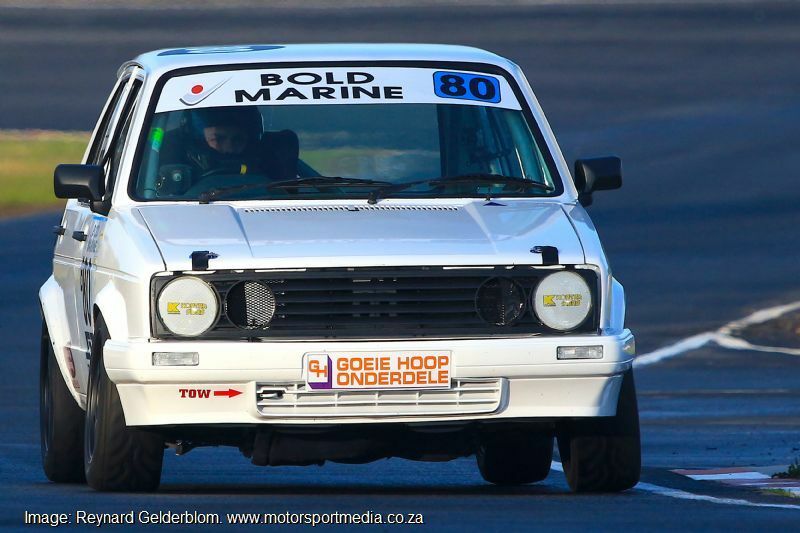 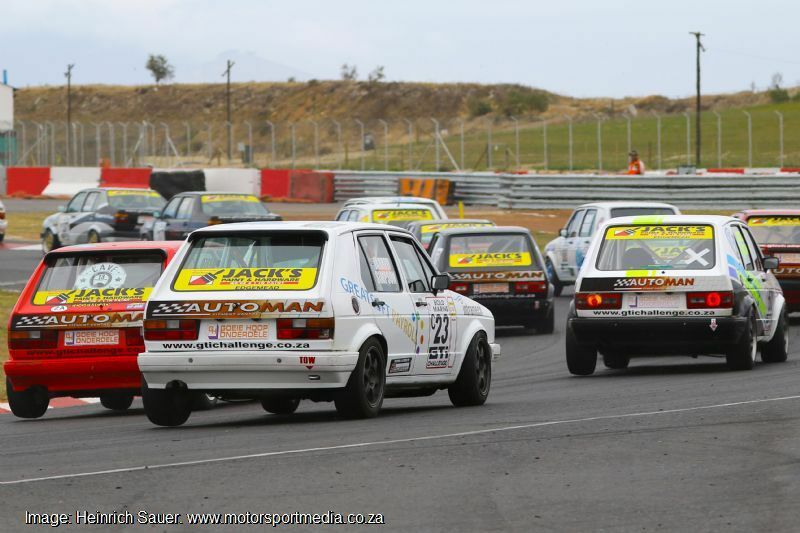 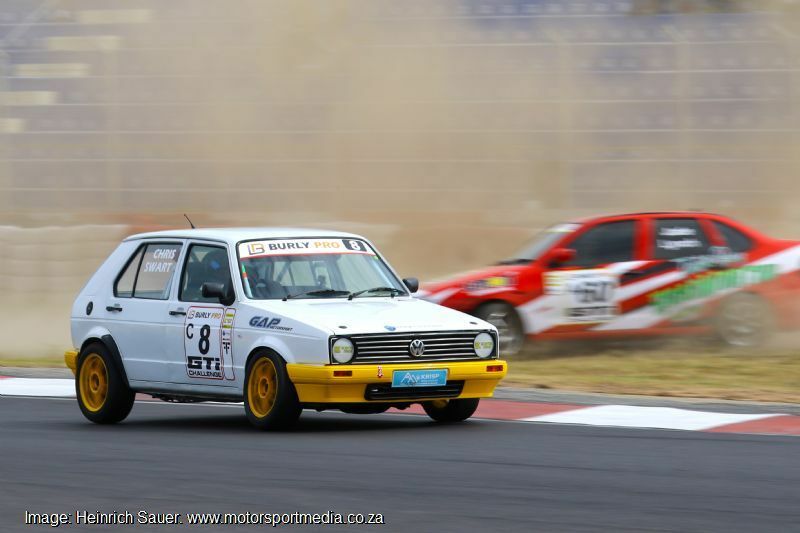 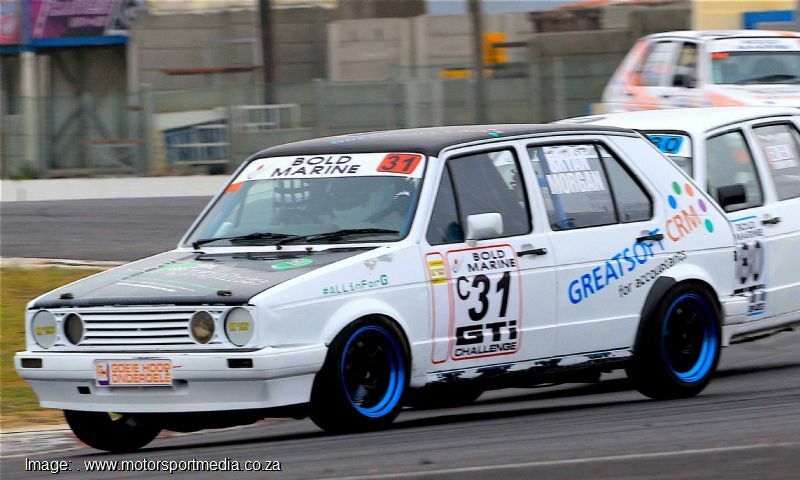 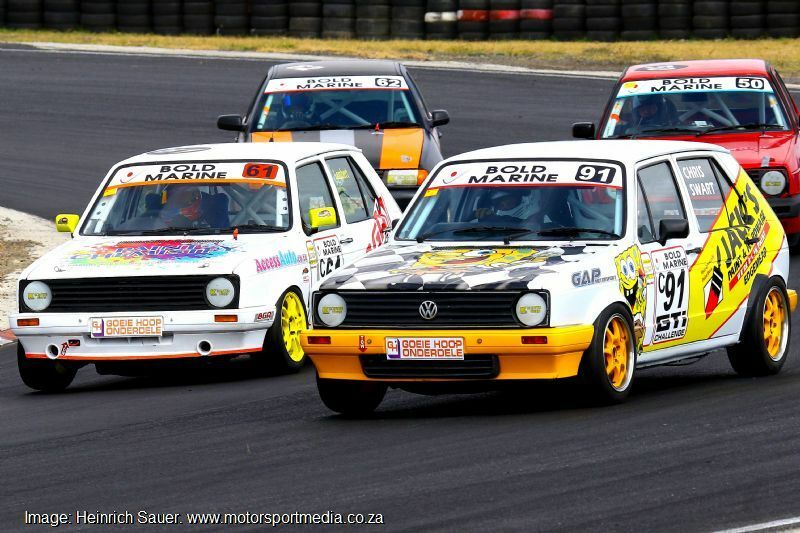 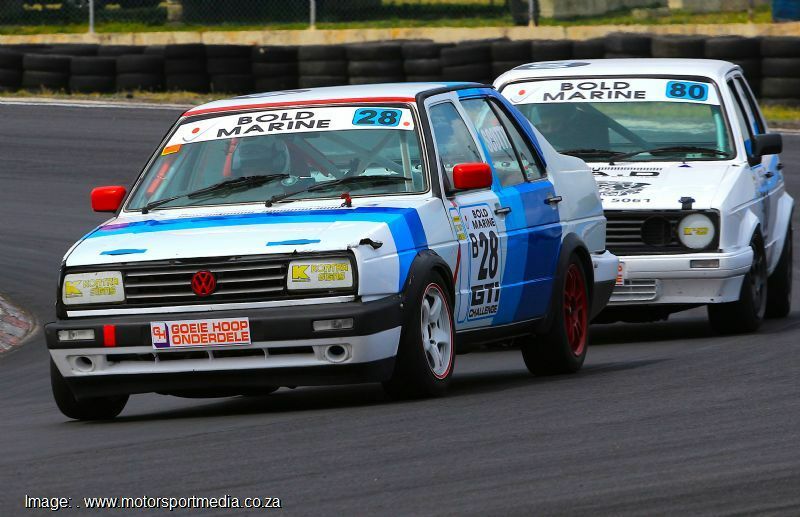 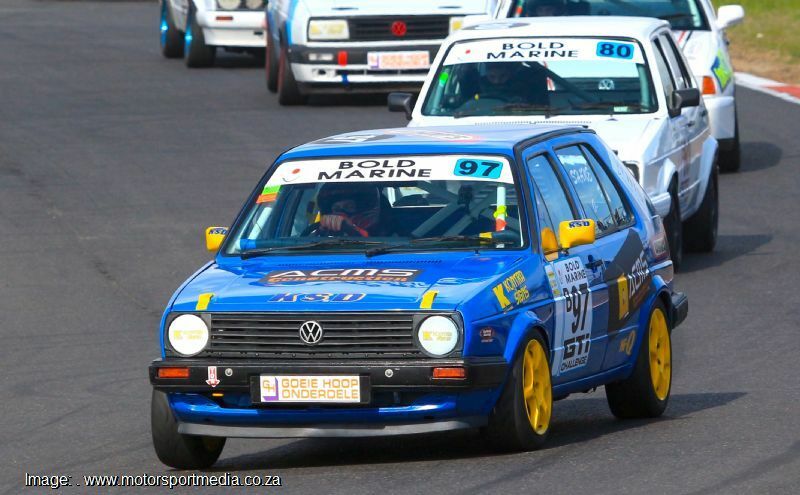 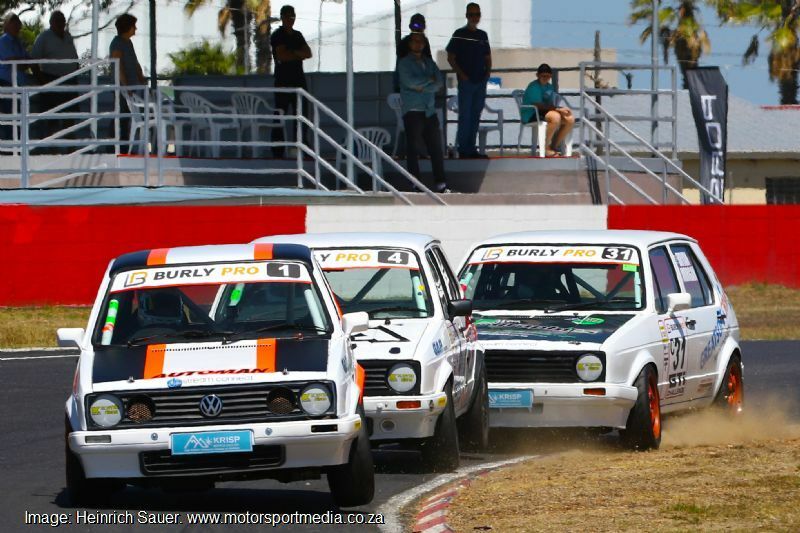 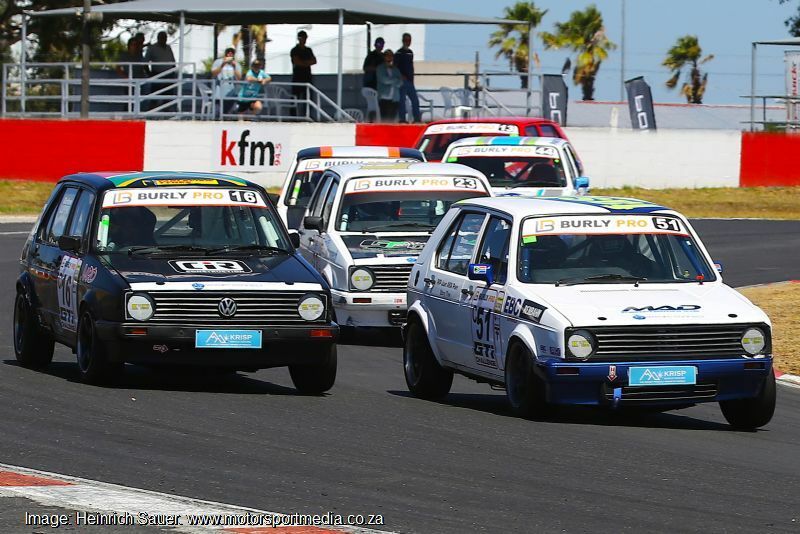 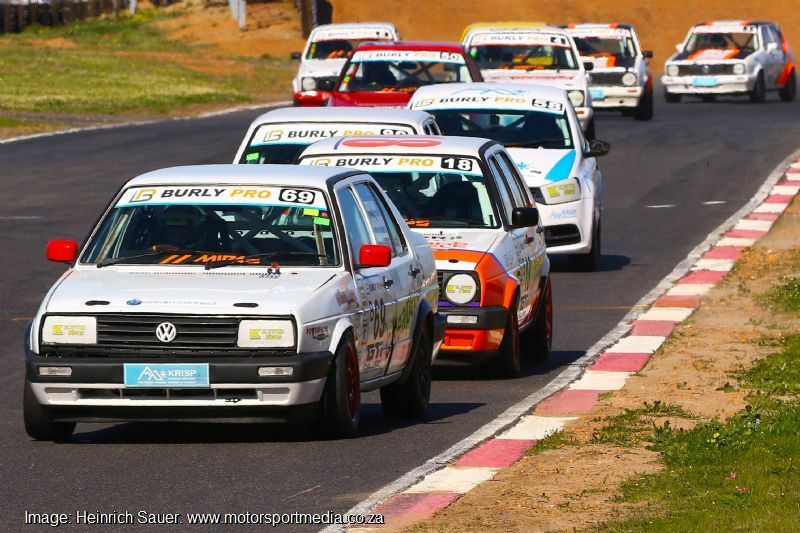 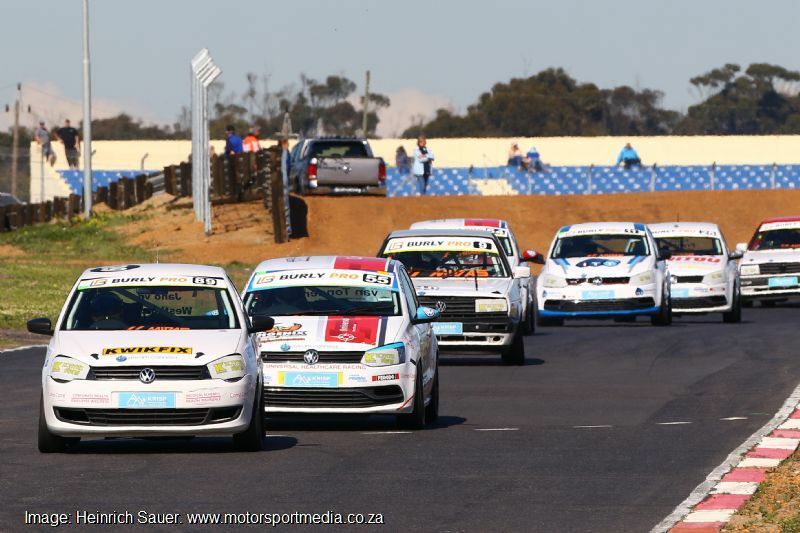 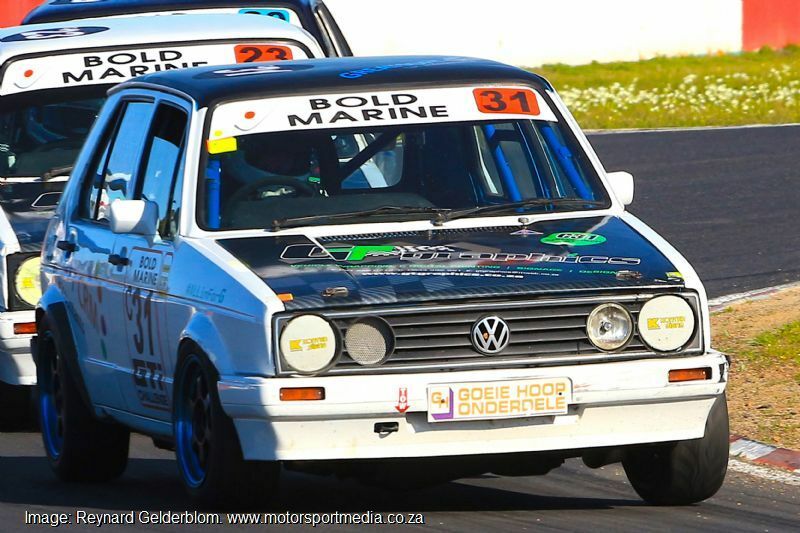 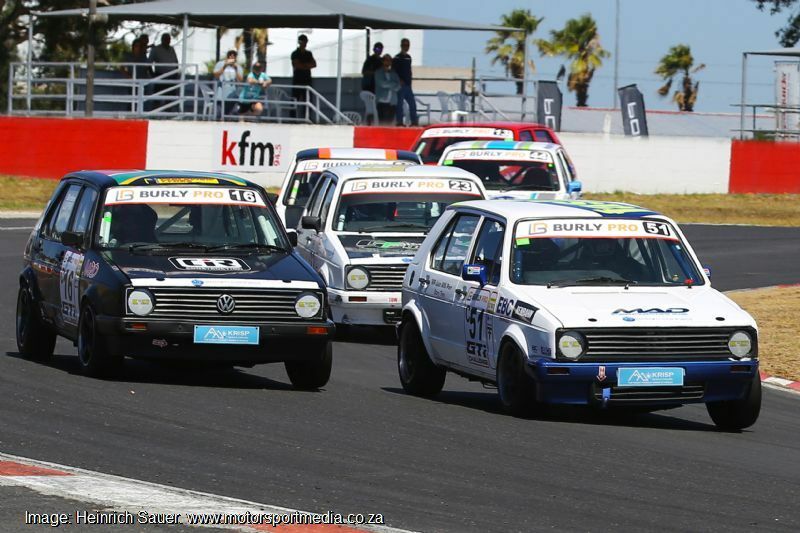 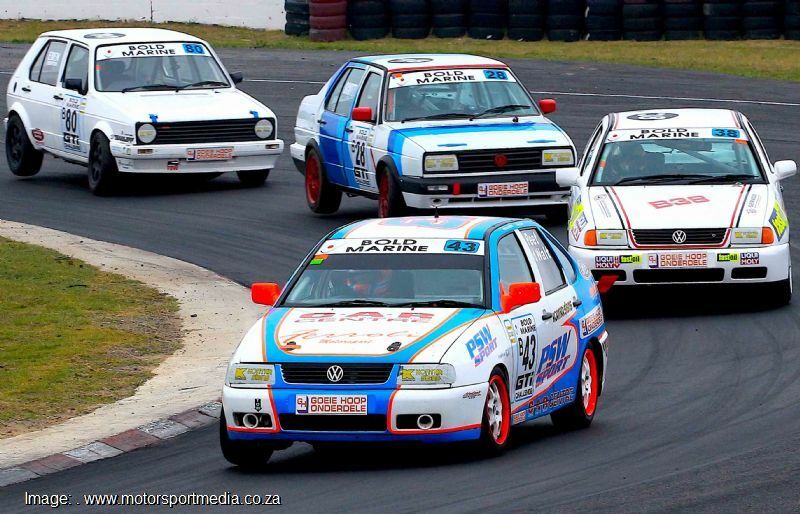 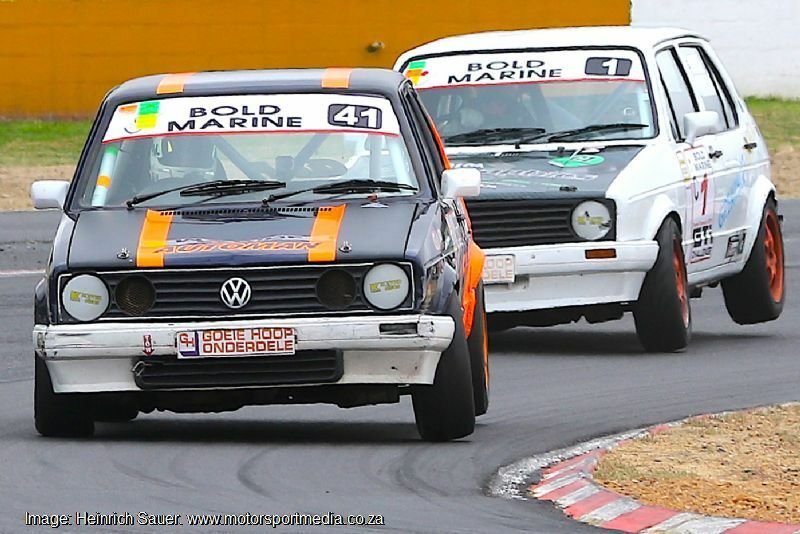 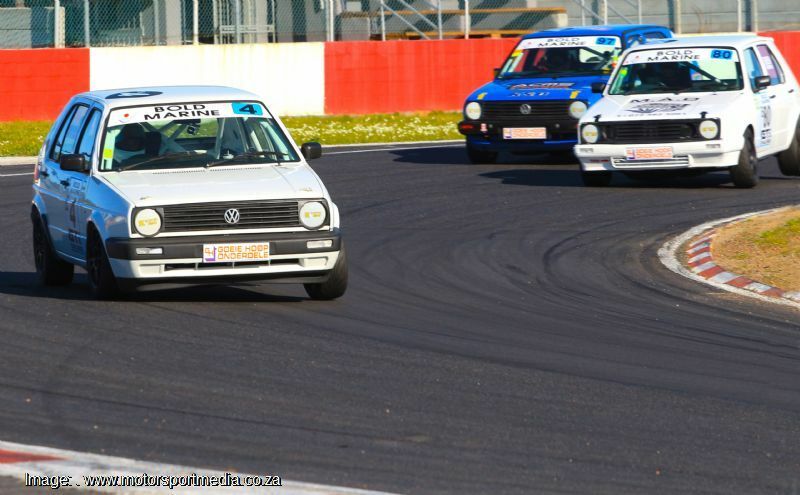 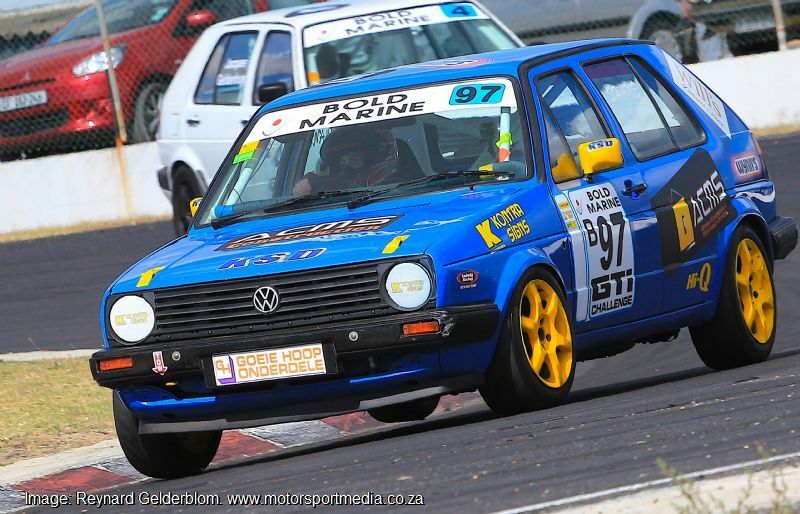 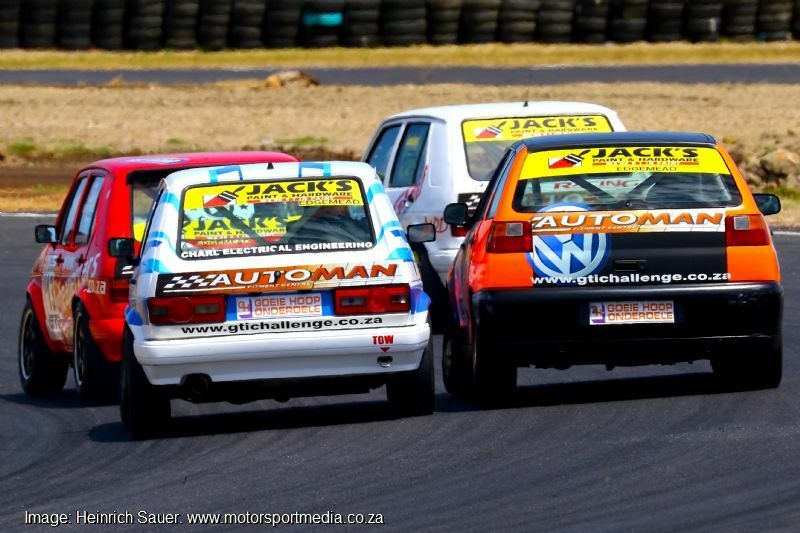 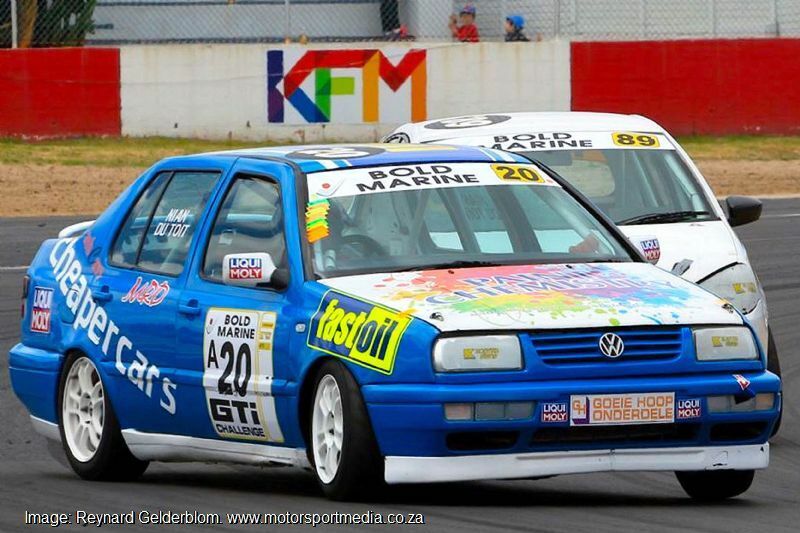 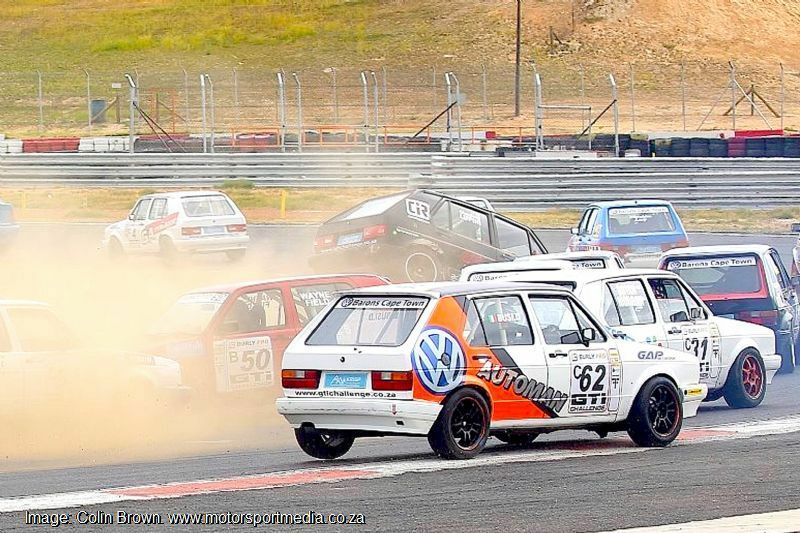 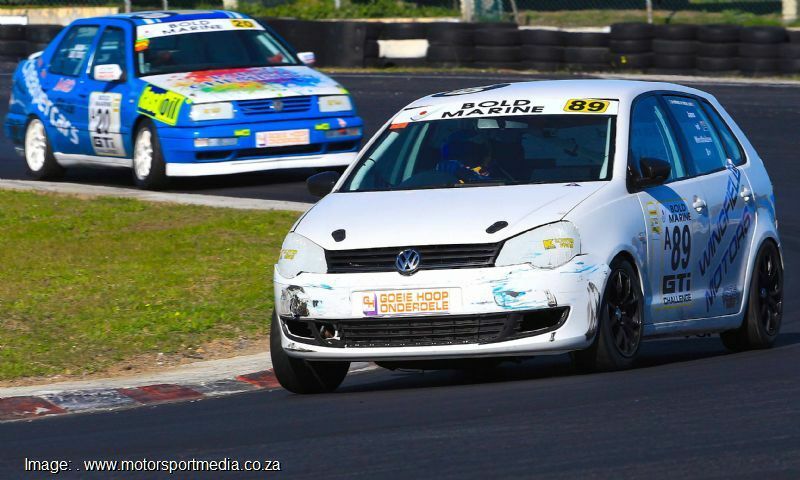 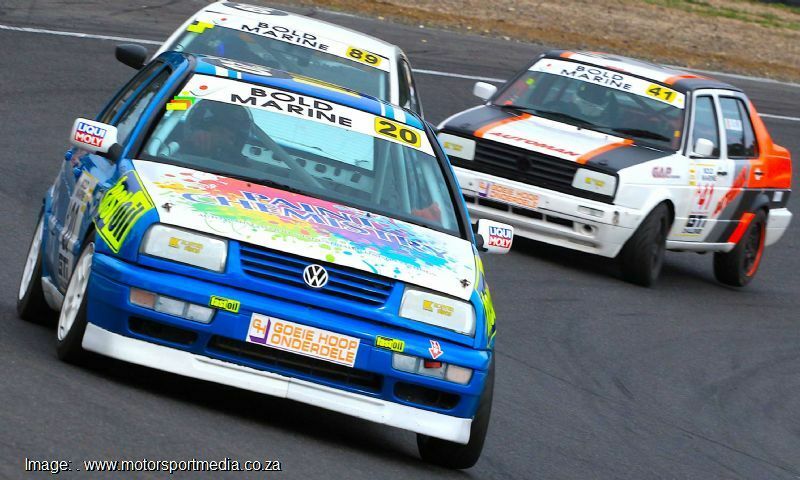 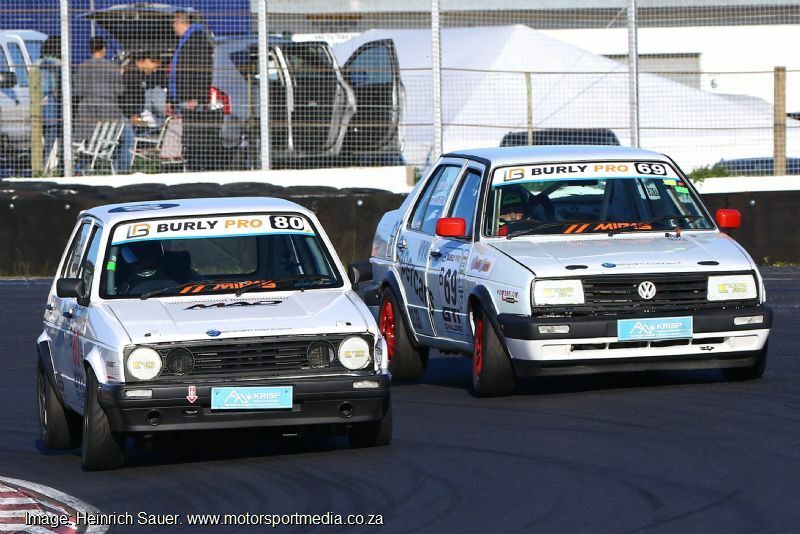 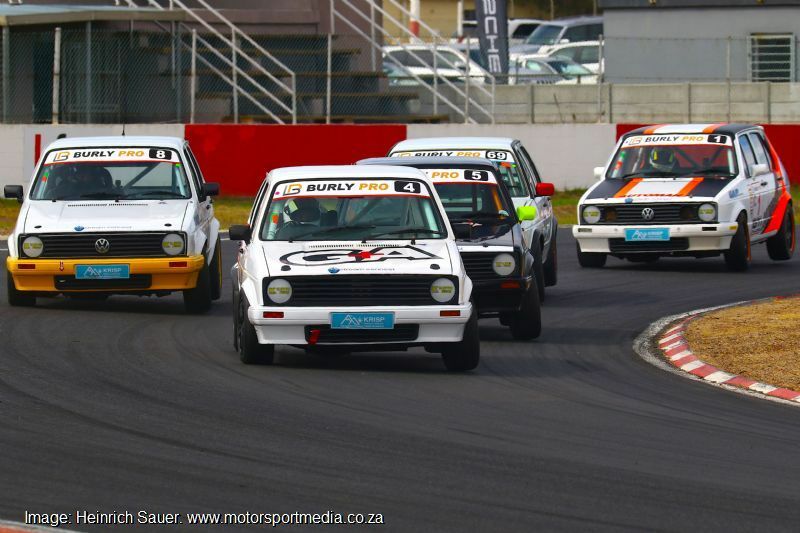 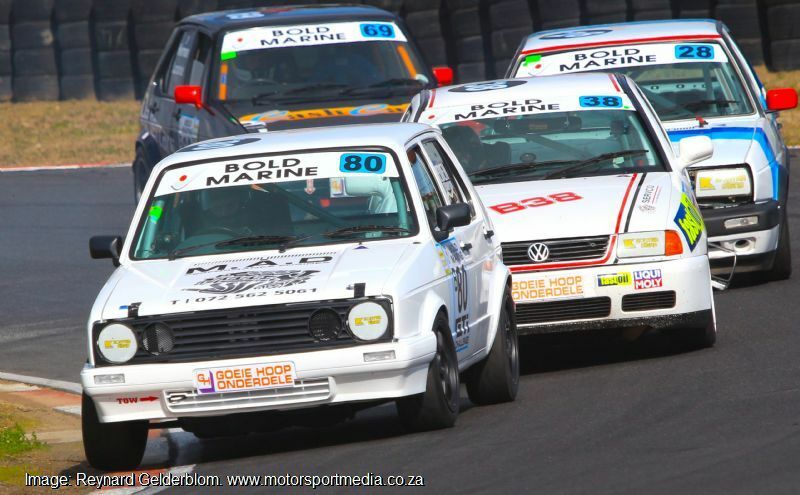 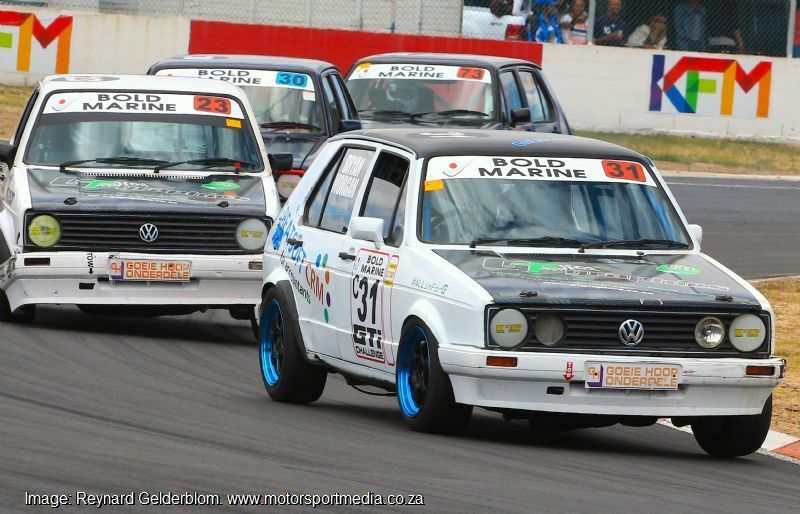 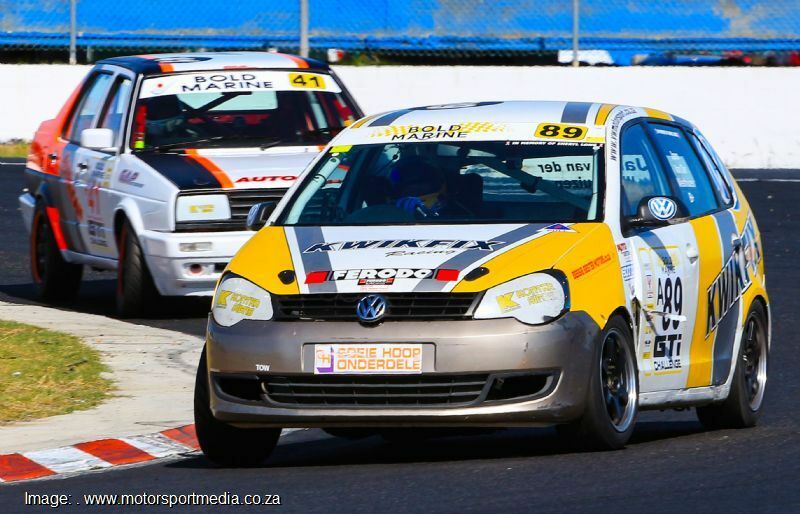 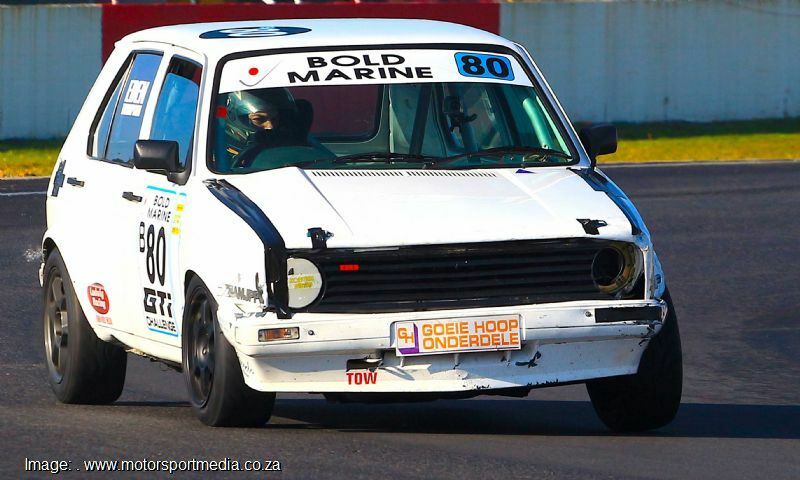 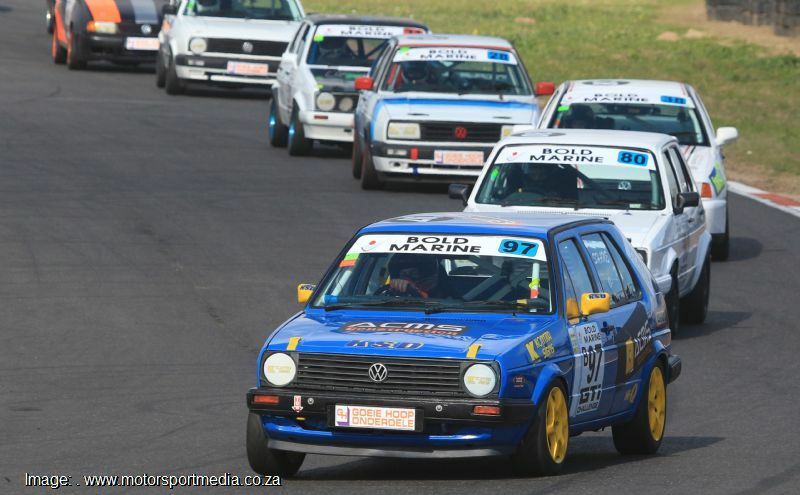 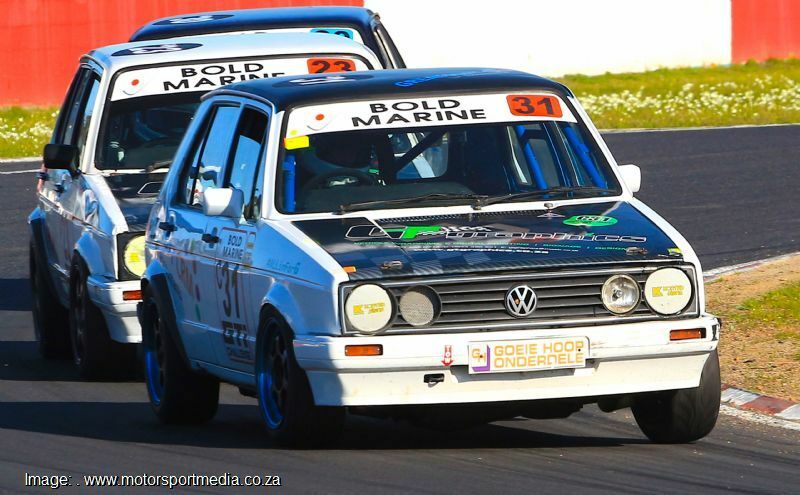 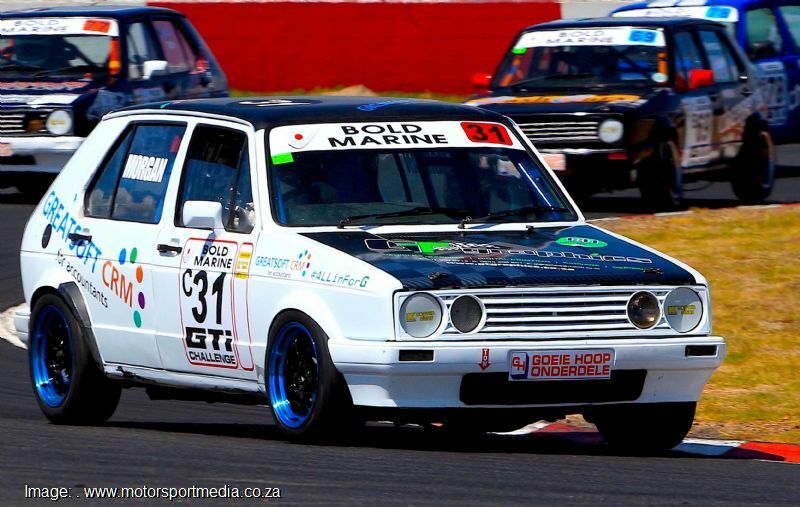 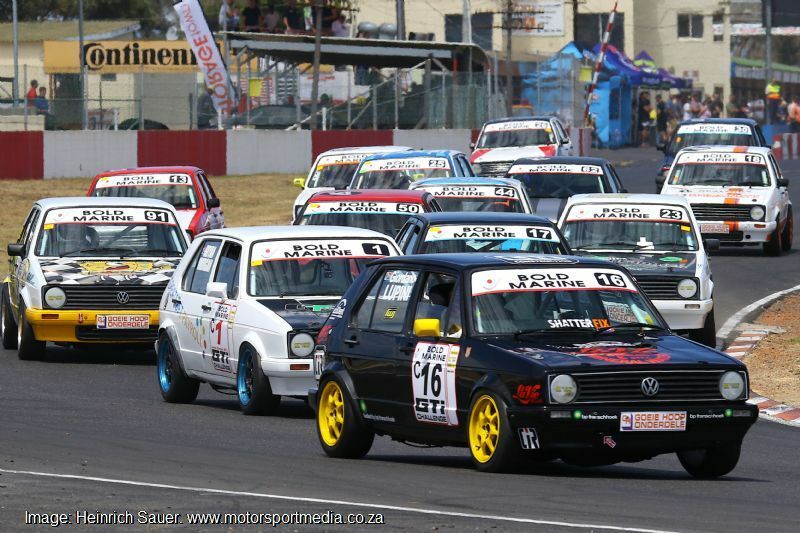 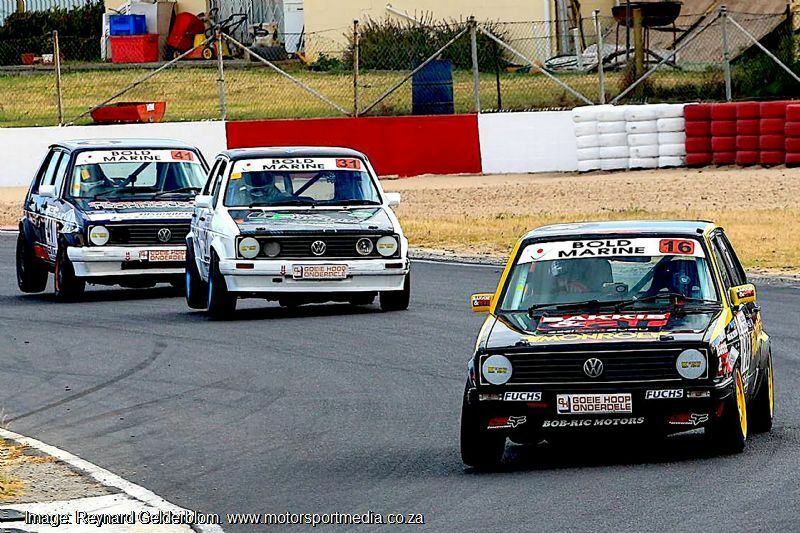 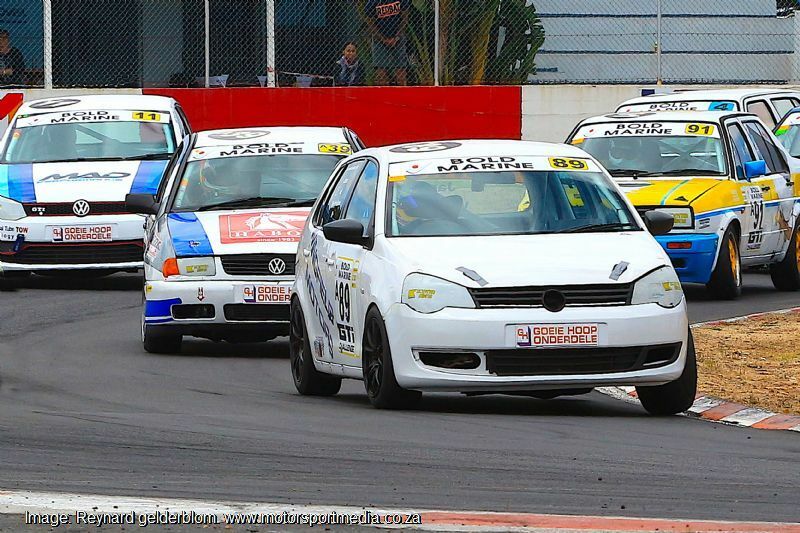 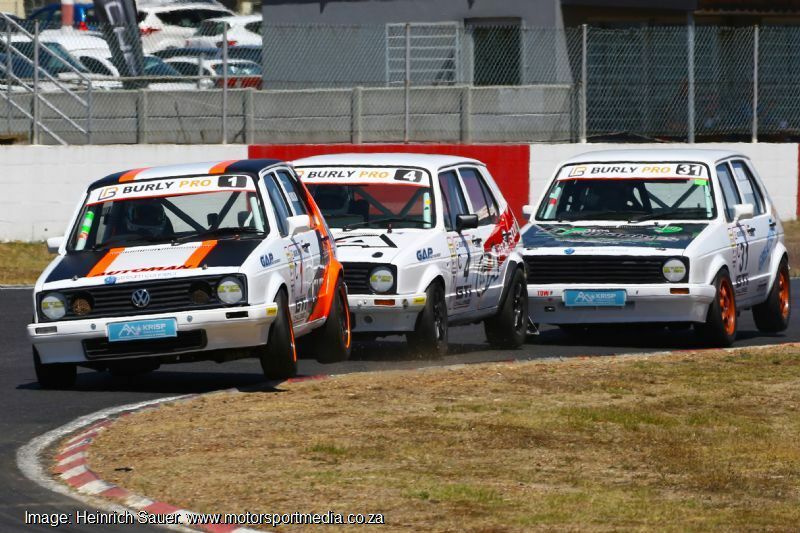 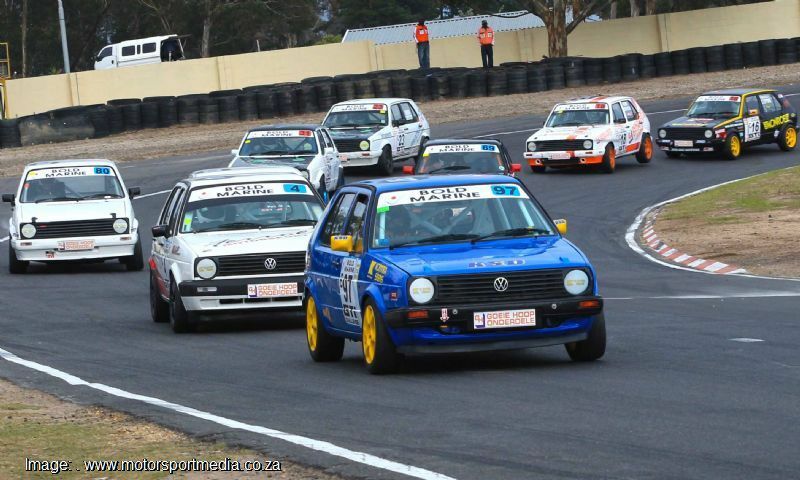 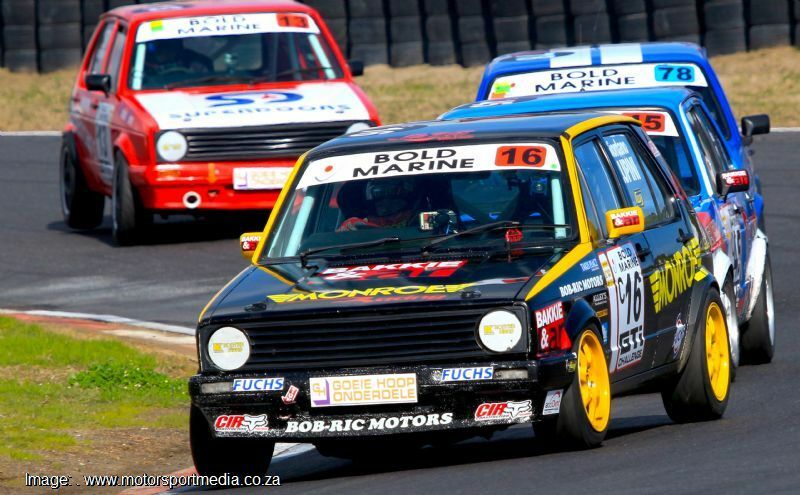 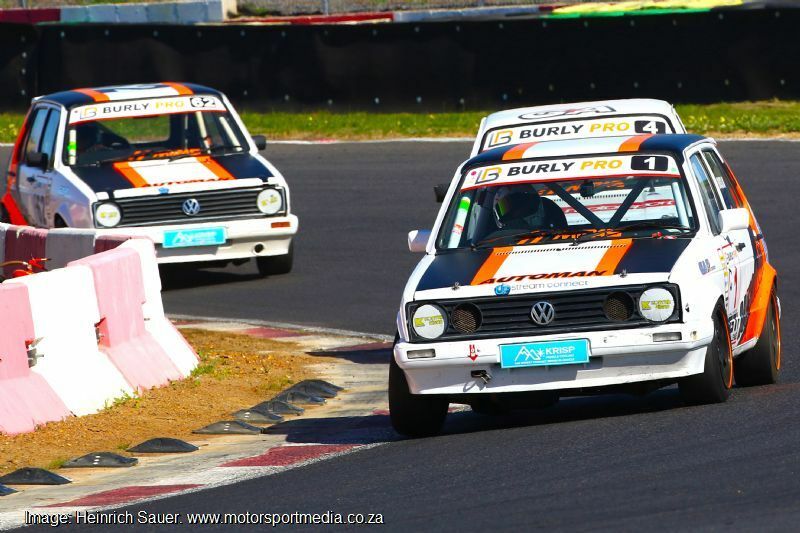 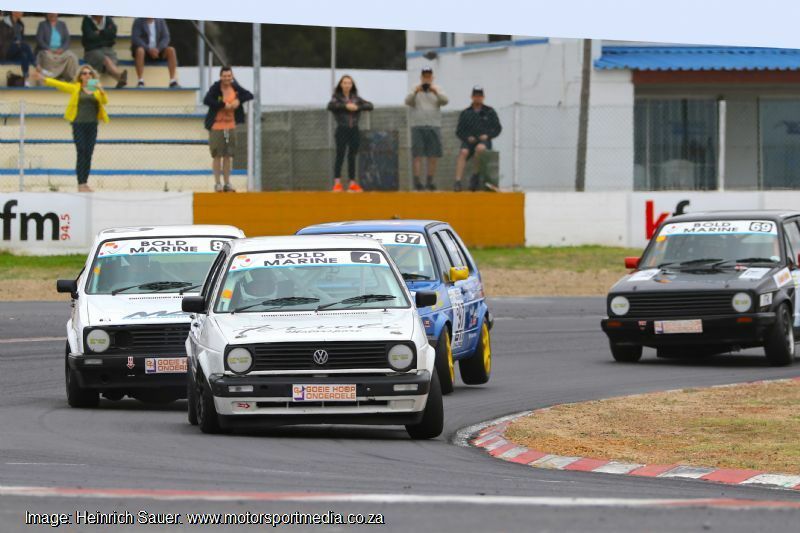 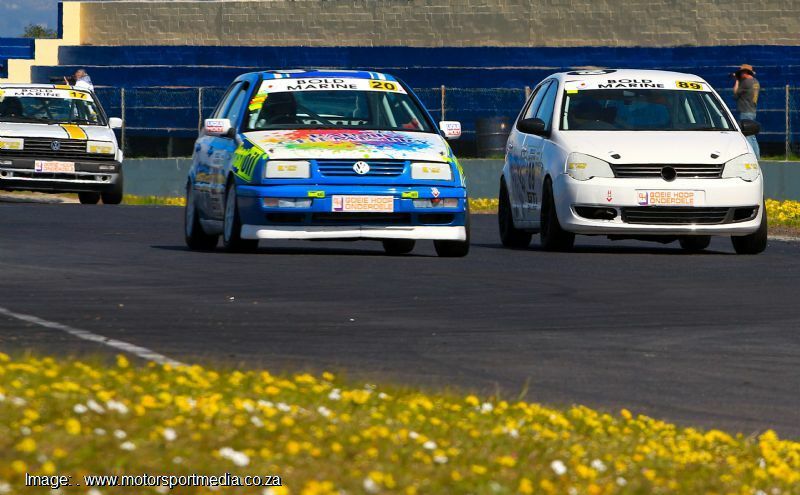 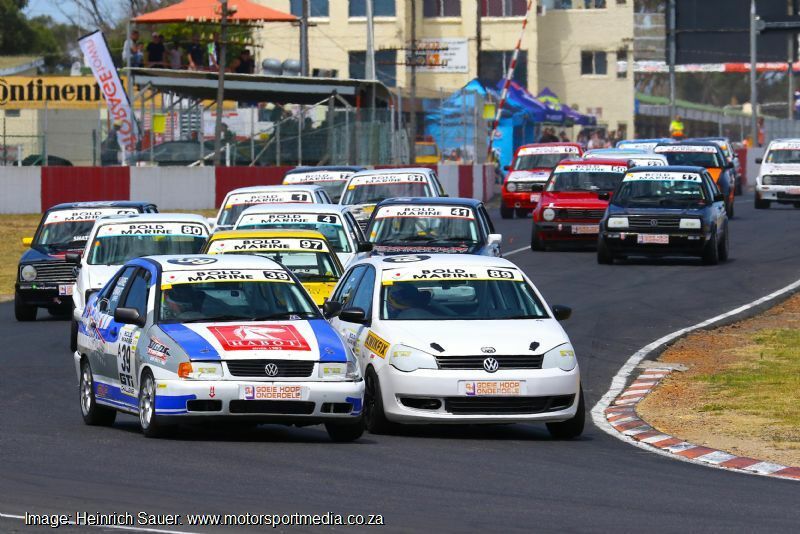 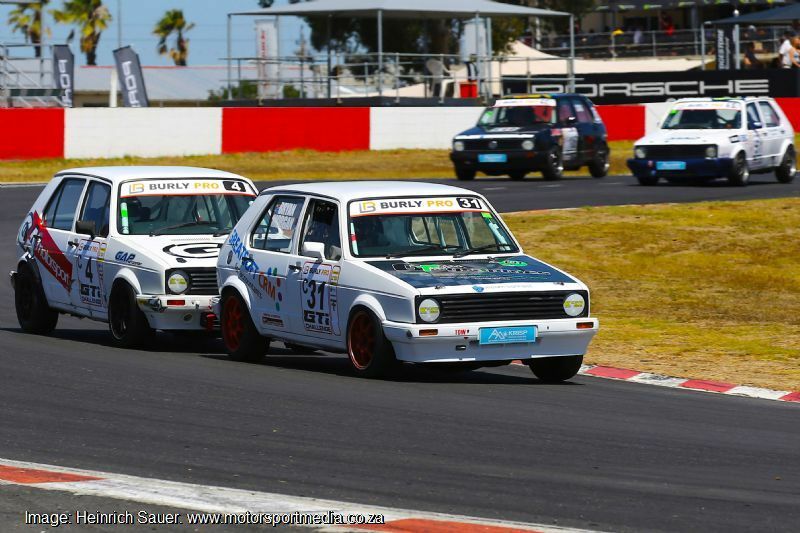 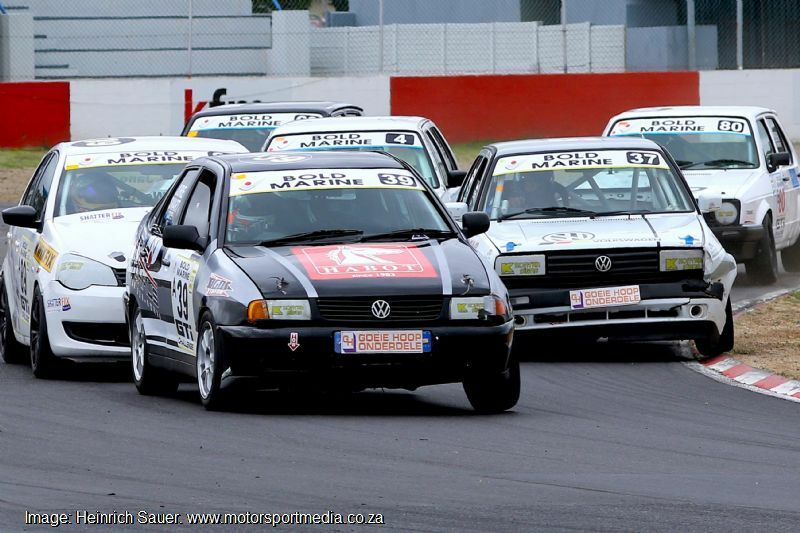 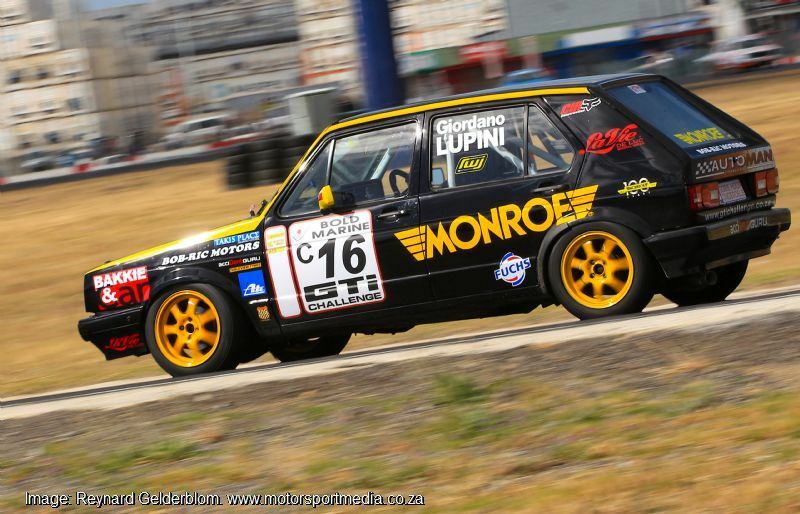 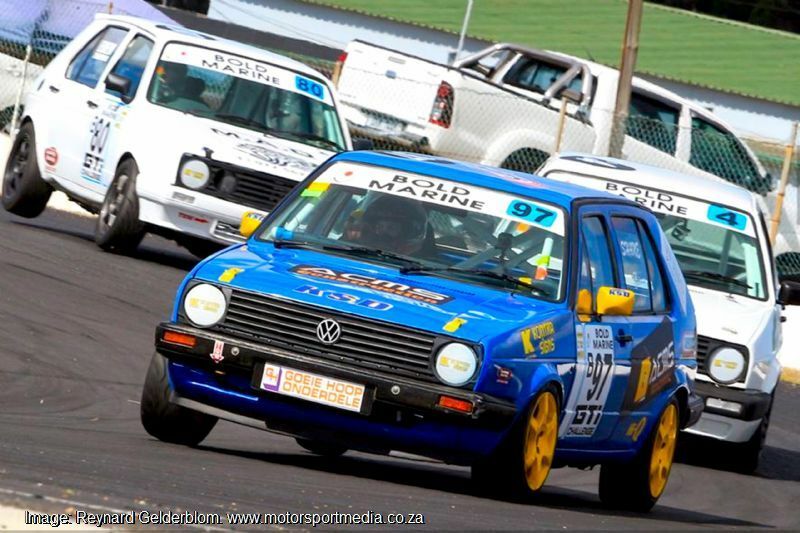 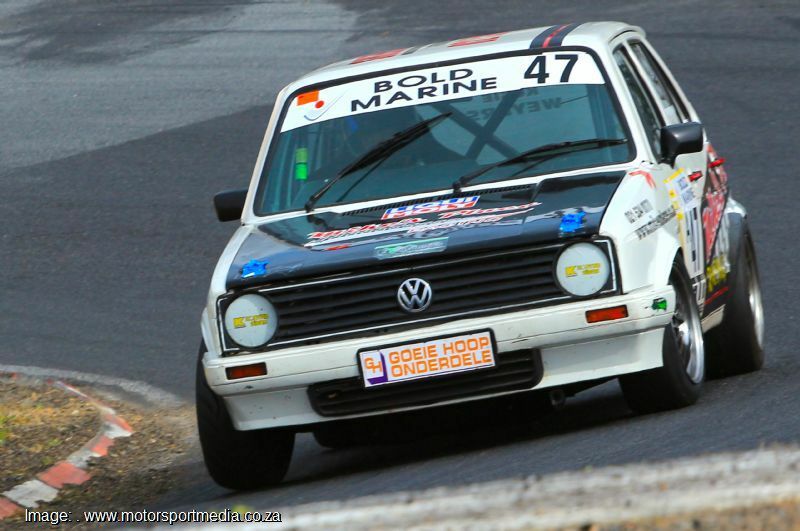 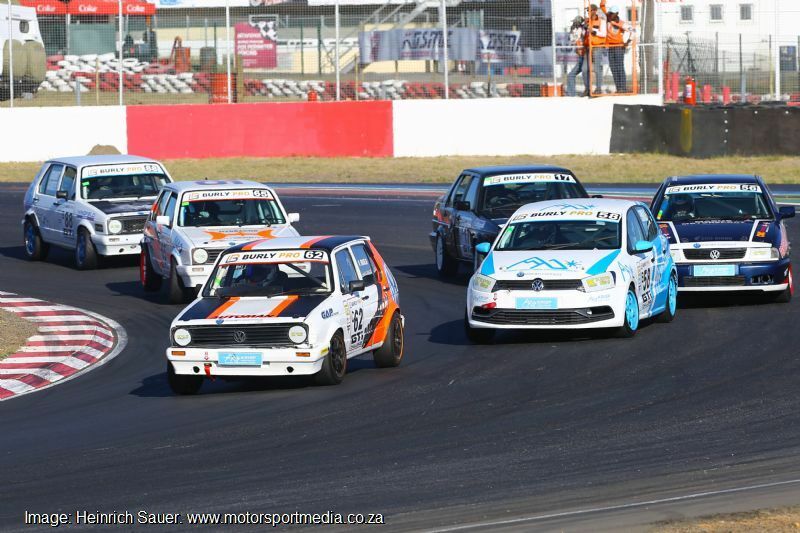 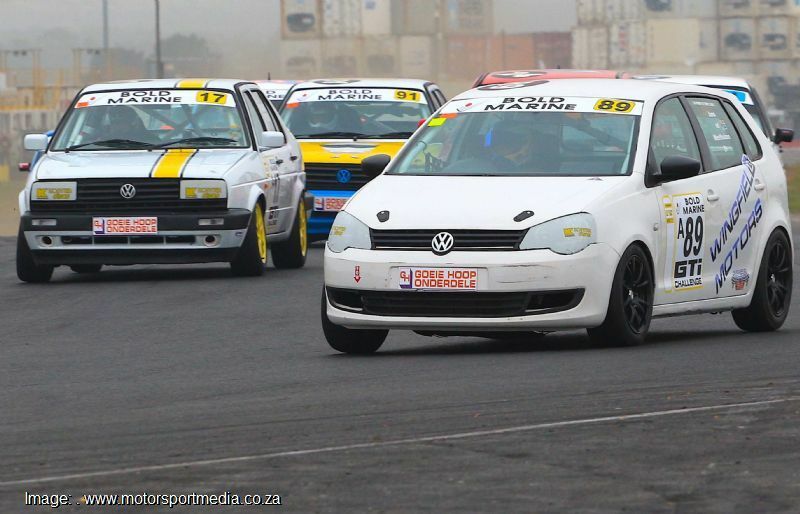 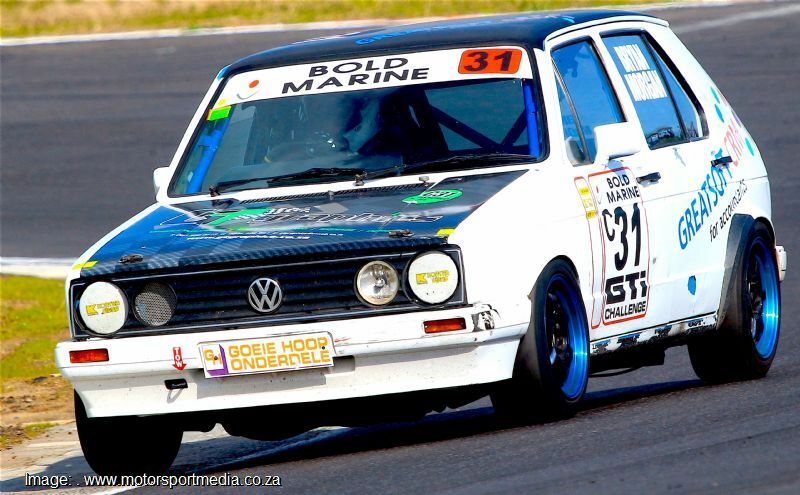 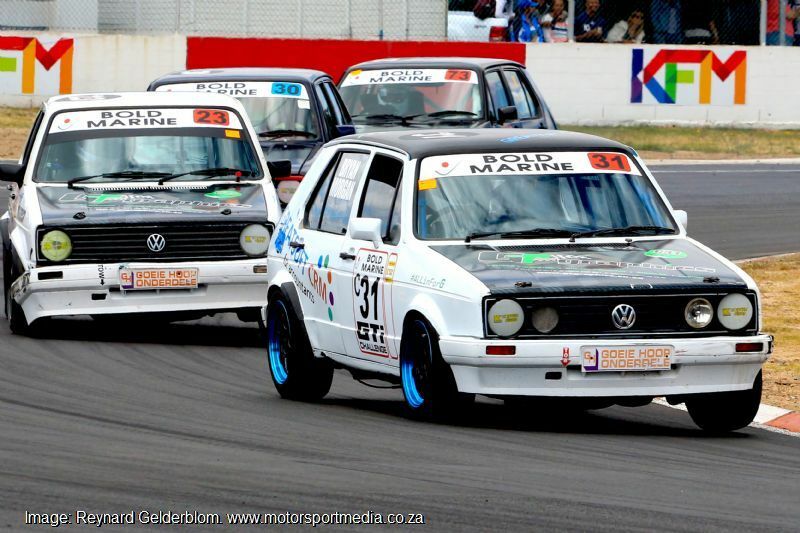 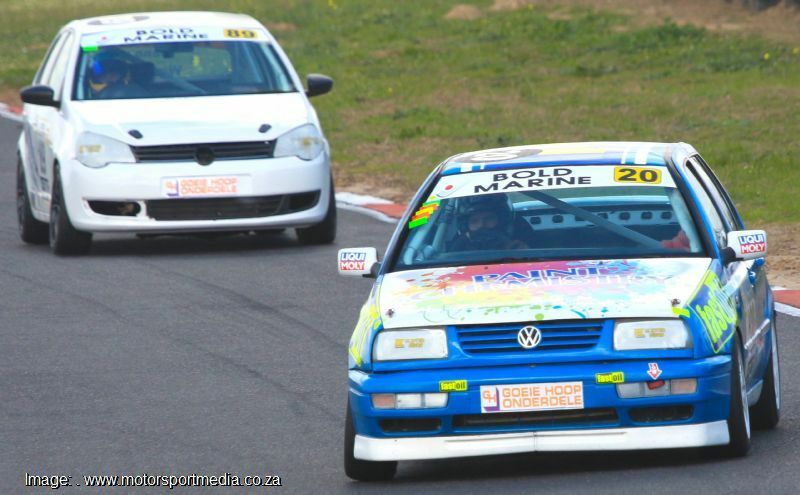 The Bold Marine GTi Challenge is a one make race series catering for all VW products that offers an affordable means of getting into motor racing. 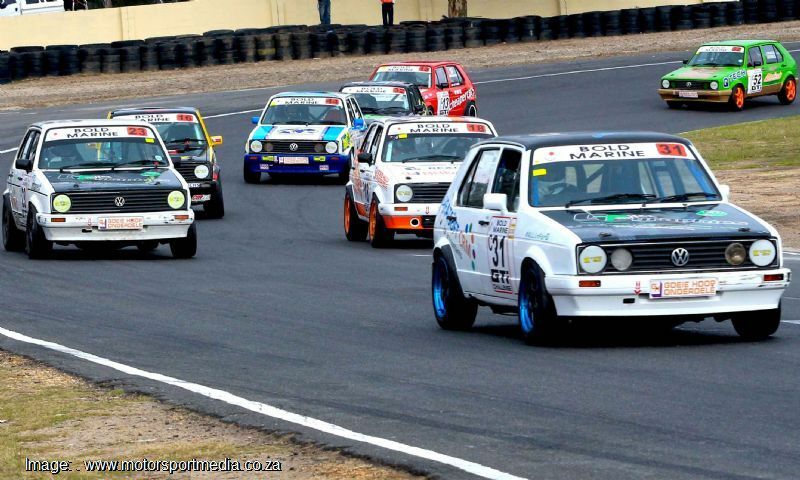 The Challenge was established in 1998 when the GTi Club approached Killarney to introduce a local GTi Challenge and three races were included in Killarney regional race days where members raced their everyday road cars. 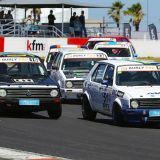 The grid grew from 8 to 15 cars by the third race and the seed was planted with some of the class pioneers still racing today. 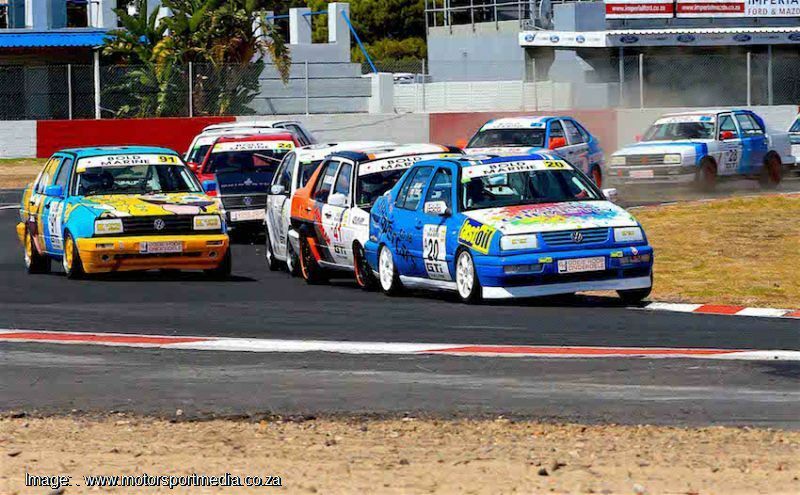 In 2000, MSA insisted on roll cages, race seats, harnesses and extinguishers and a set of rules was introduced for a 7 race series and the Challenge was born. 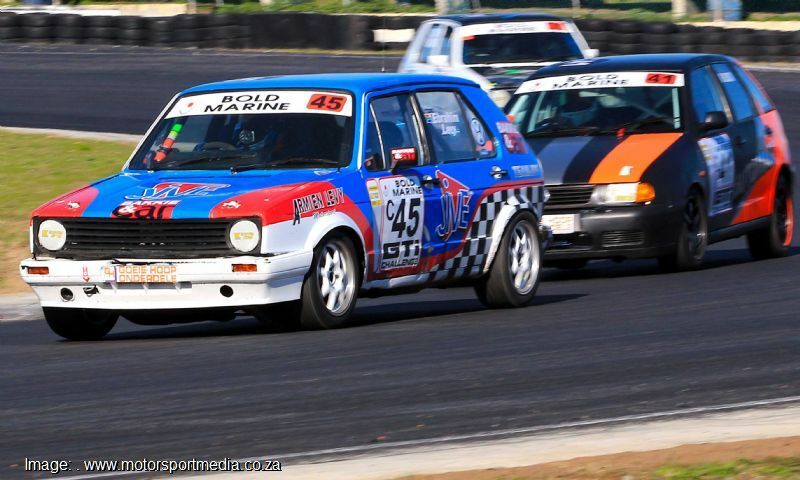 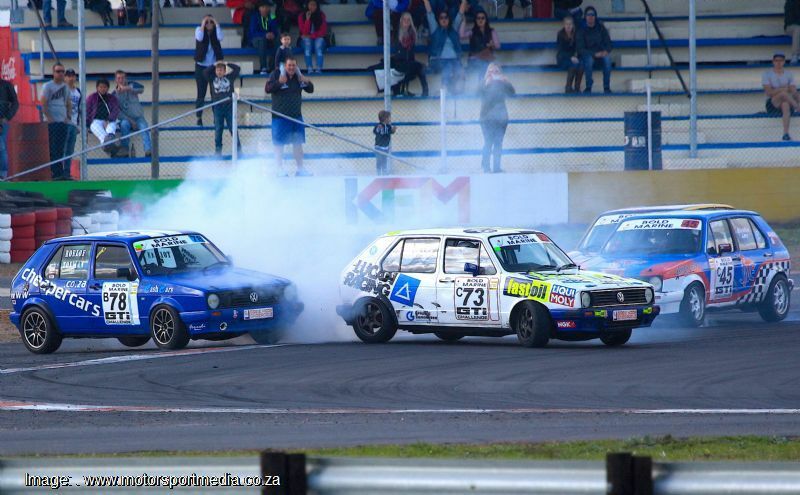 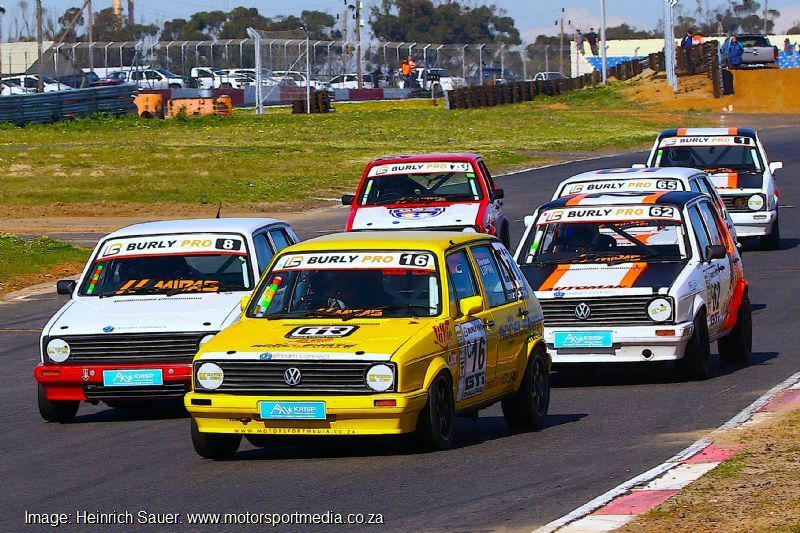 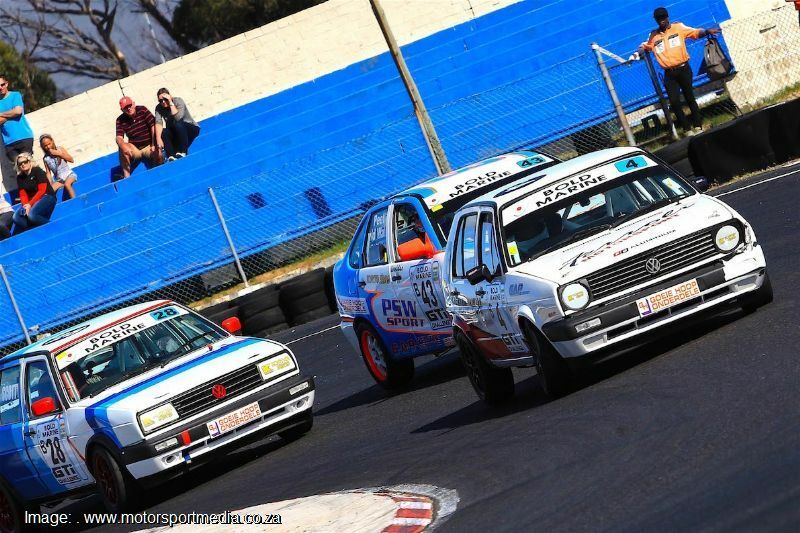 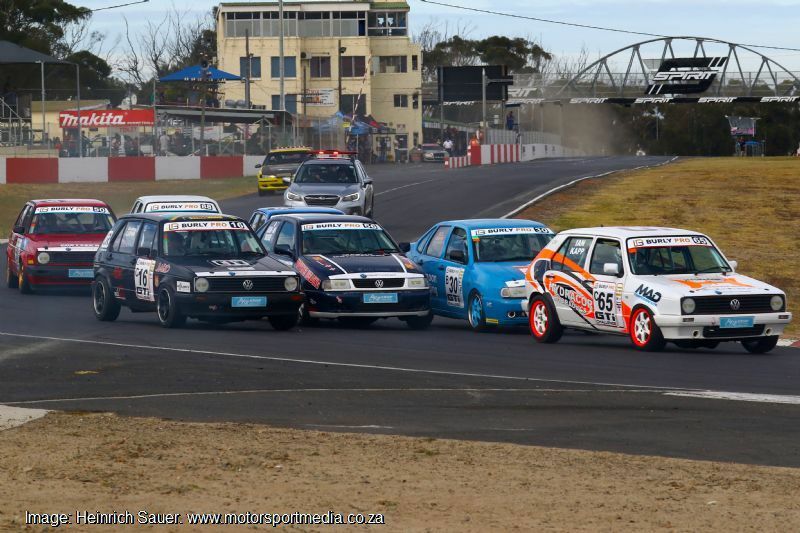 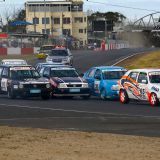 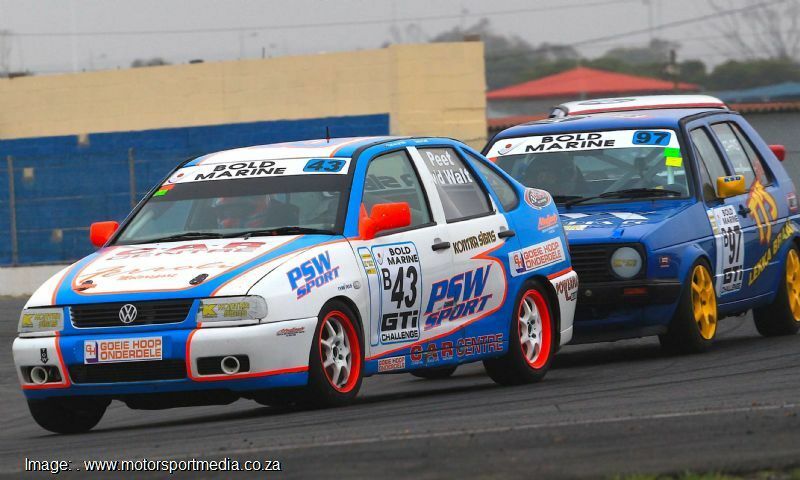 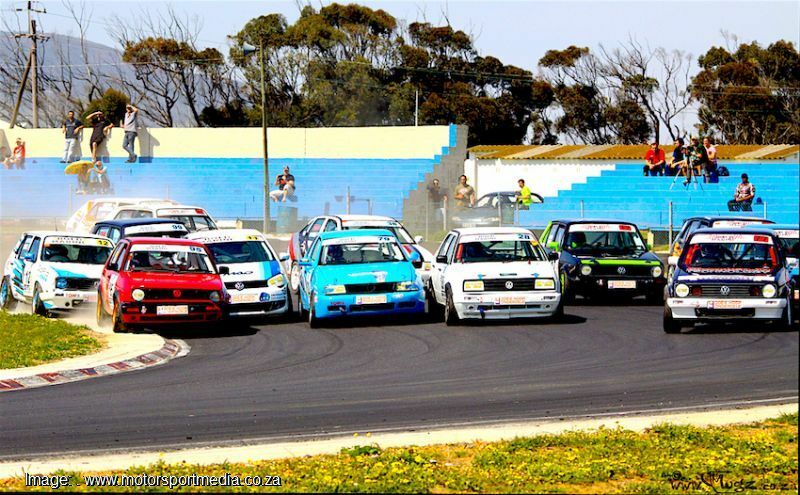 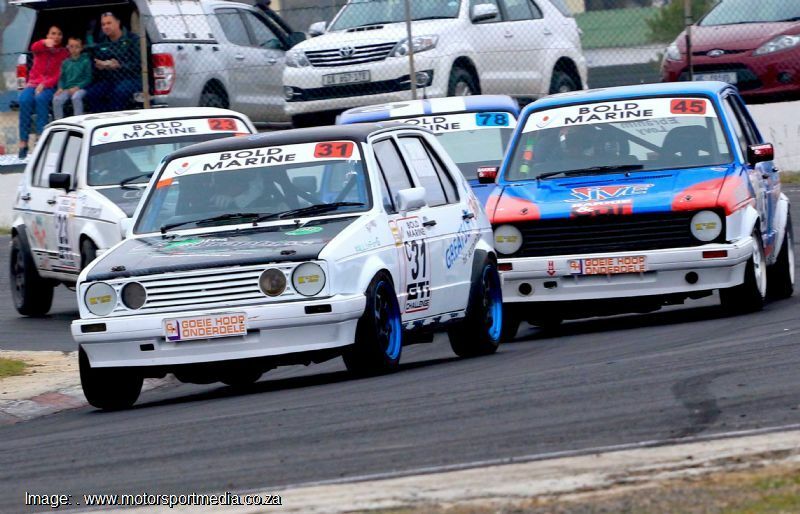 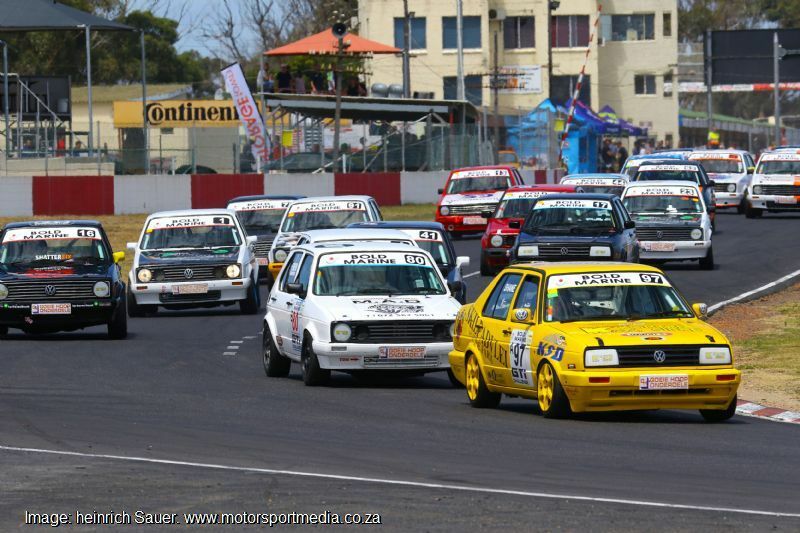 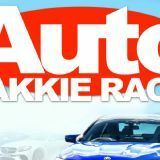 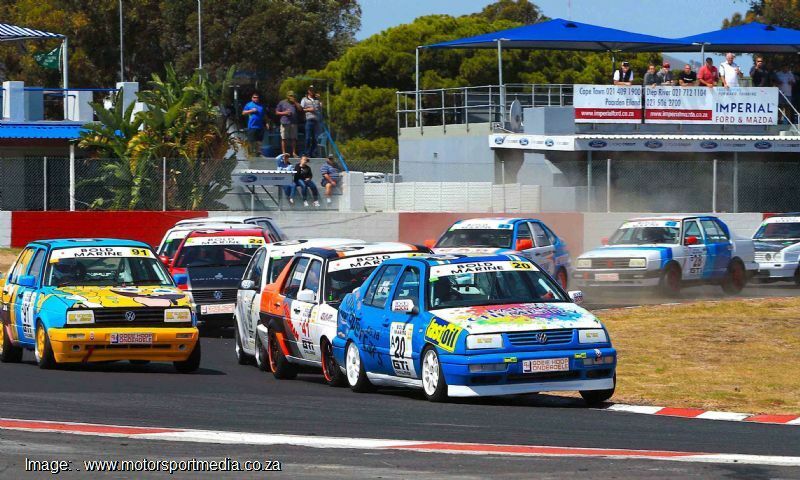 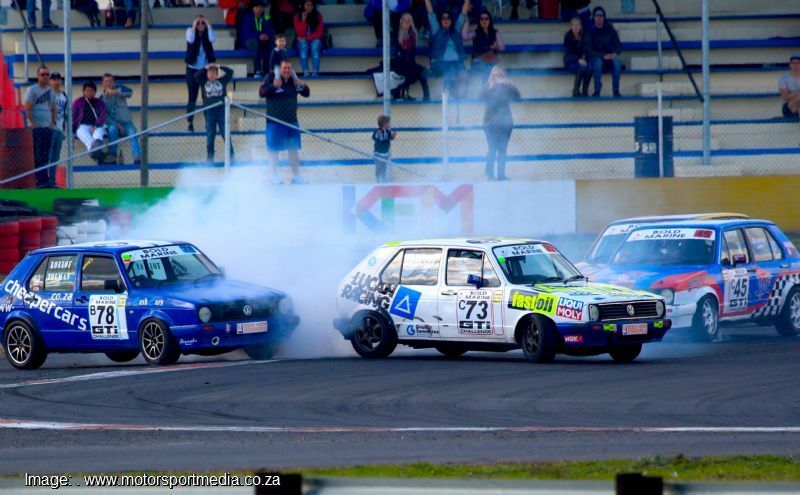 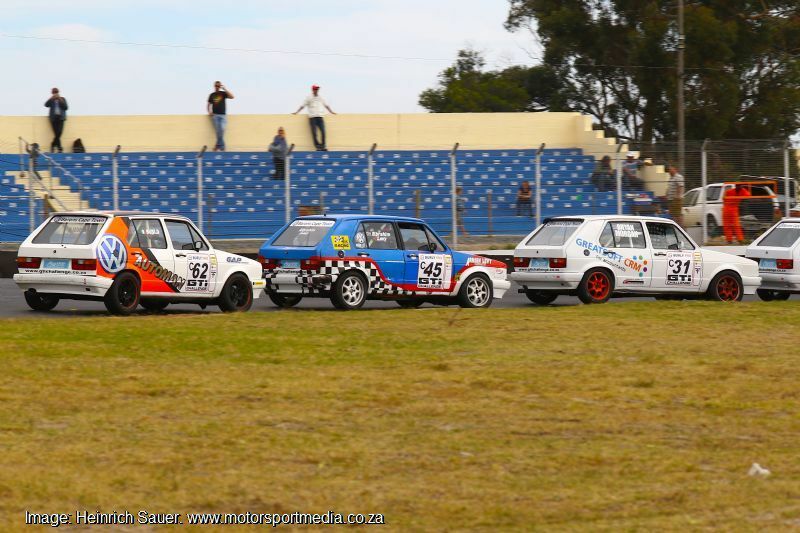 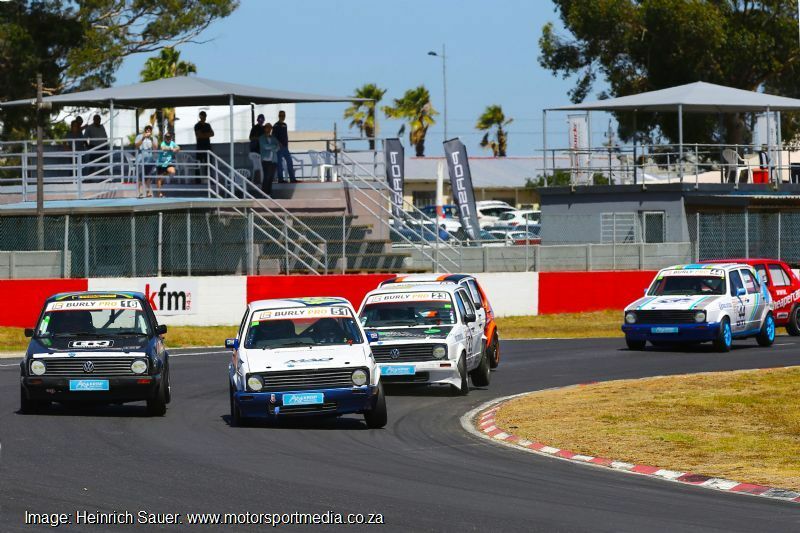 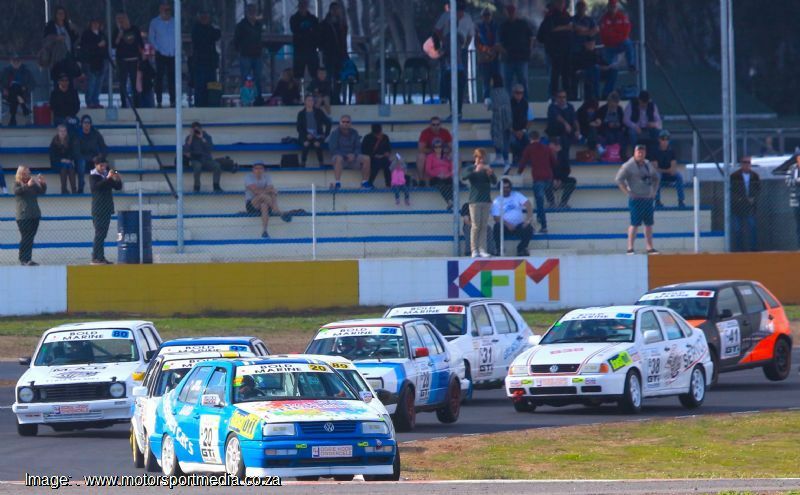 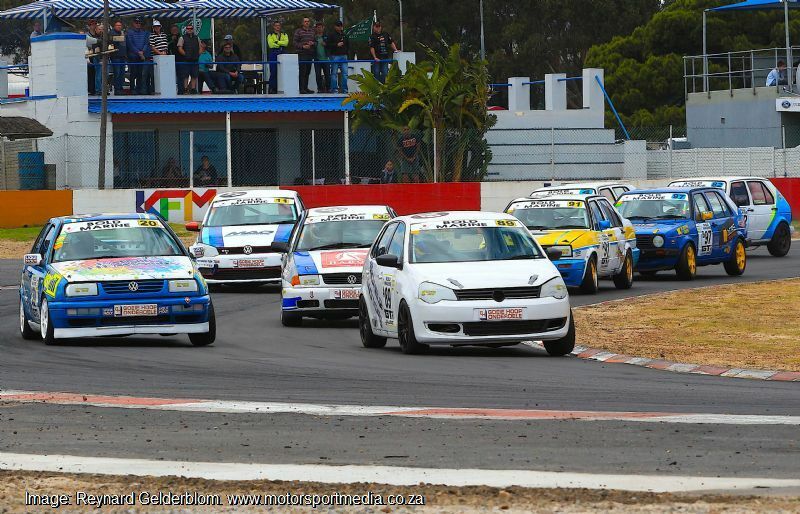 The Bold Marine GTi Challenge is a regular highlight of WPMC Killarney Power Series meetings with its close, exciting and colourful racing highly popular with fans and race goers alike. 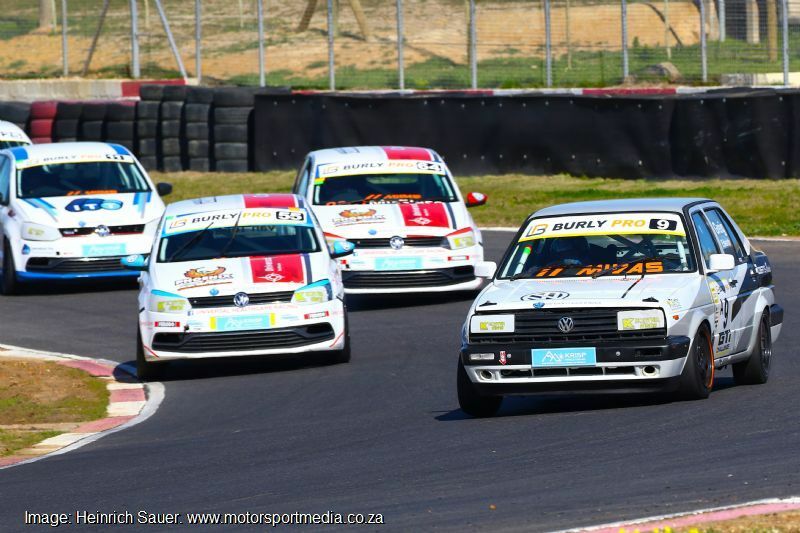 Killarney Circuit Manager Paul Simon emerged overall GTi Challenge champion for the second year in a row for 2015 as he scooped back-to-back Class C titles en route to beating Class B duo, Challenge Chairman Zaki Hendricks and Craig du Toit to overall honours, while Marco Busi added the Class A title to his tally of titles in fourth overall. 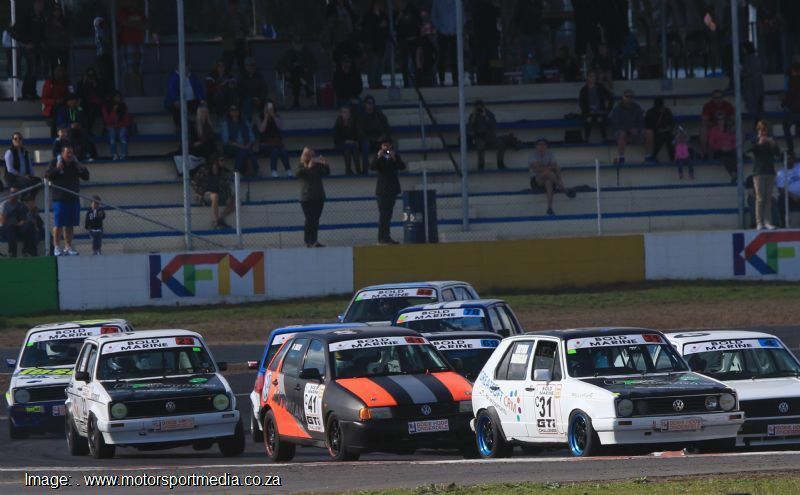 Interestingly none of Simon, Hendricks and du Toit have raced this year, but those who have run, put on the usual spectacular display, with the first race of the season living up to its destructive reputation to be reduced to a 12-lap single heat after a sizeable first lap crash. 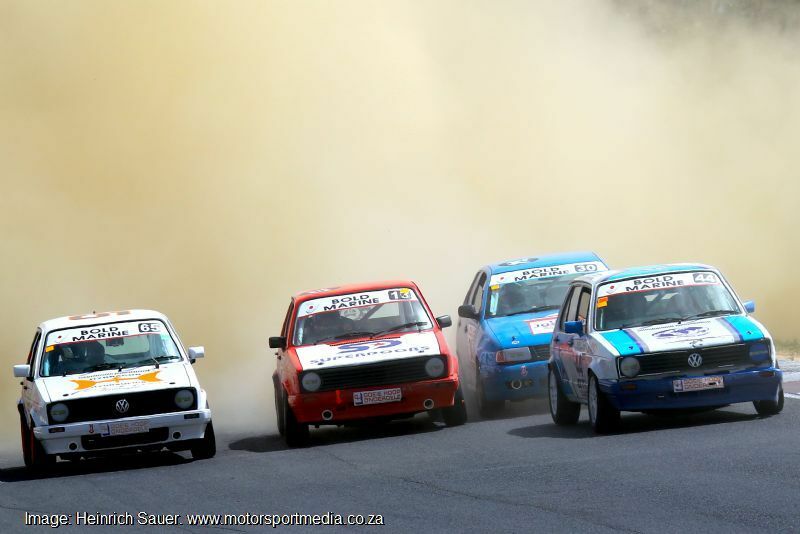 It has been a little milder since then. 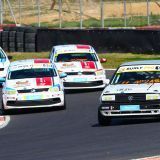 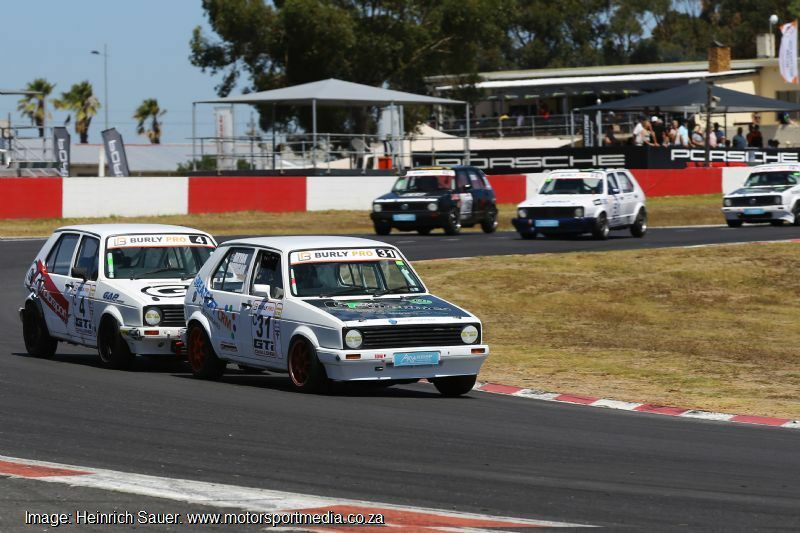 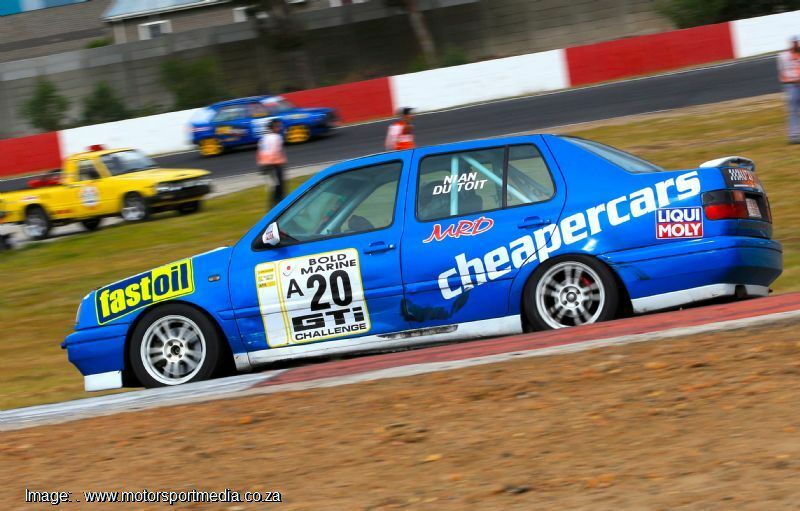 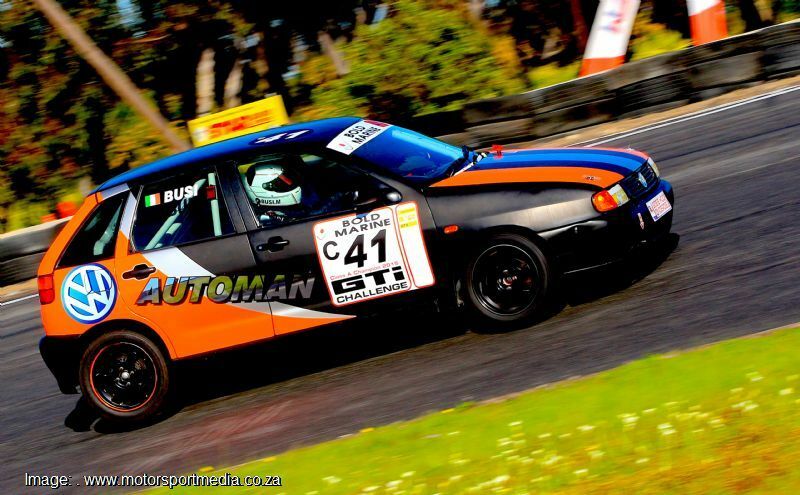 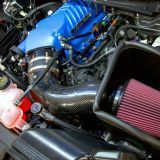 In all, GTi Challenge continues to offer a remarkably inexpensive, properly run, very well controlled and highly competitive form of local circuit motor racing that covers everything from a step up from karting to a serious arena for top competitor. 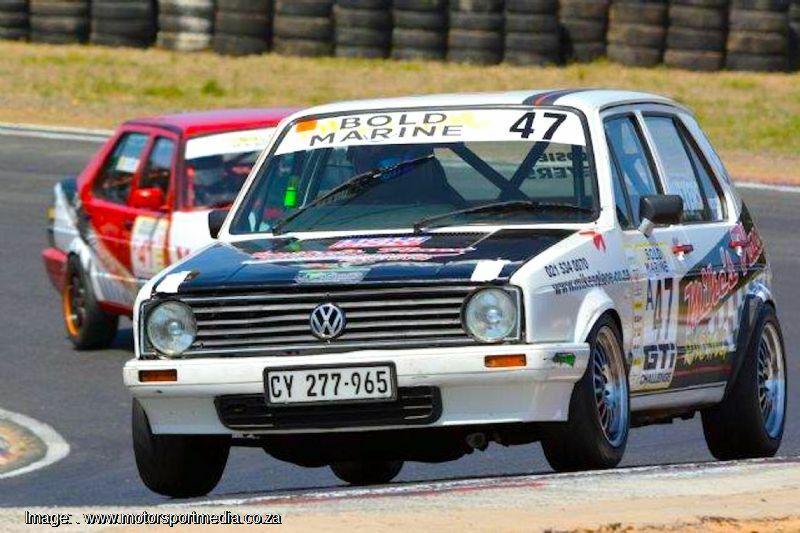 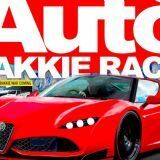 It is much loved, well received and wildly popular, it’s a great place to race in spite of difficult trading and financial pressures, so all in all, the Bold Marine WP GTi Challenge finds itself in a pretty happy place right now.